That's it, munch pellets in Time-Stopping Pellet-Time®. The ghosts only move when you move, learn their tactics and get better at Pellet-Munching! Also, the maze is different every time, so no timing tricks, just skillz! Pretty much the best thing (in my opinion) in this game is the 80's game logic. What I mean is how the game works and there are static ways of how the ghosts "think". Not like modern games. I know how the red one moves, which i guess was the easiest. He just follows you. The retro graphics are really nice too. The game has turned out really cool and I'm a fan of it. Keep up the good work! 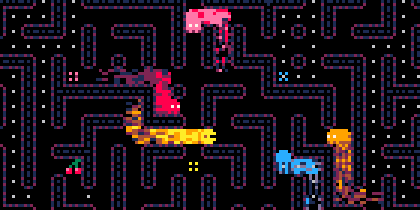 The ghosts behaviours are actually based on original pac-man. The pink one tries to get ahead of you, the blue one tries to trap you between him an the red one, the orange one chases you from a distance but shies away when too close.